San Miguel Beer, Star, and Alaska all put up big Ws this weekend in the 2016-2017 PBA Philippine Cup! The San Miguel Beermen continued their winning ways in the Oppo PBA Philippine Cup as they destroyed NLEX by 26 points, 106-80, in an out-of-town clash on Saturday at the Xavier University Gym in Cagayan de Oro. Alex Cabagnot led all scorers with 18 points alongside four rebounds and four assists. He also hit four three-pointers, matching NLEX’s entire total as a team. June Mar Fajardo dominated with 15 points, 12 rebounds and five blocks while Arwind Santos added 15 points and eight boards. 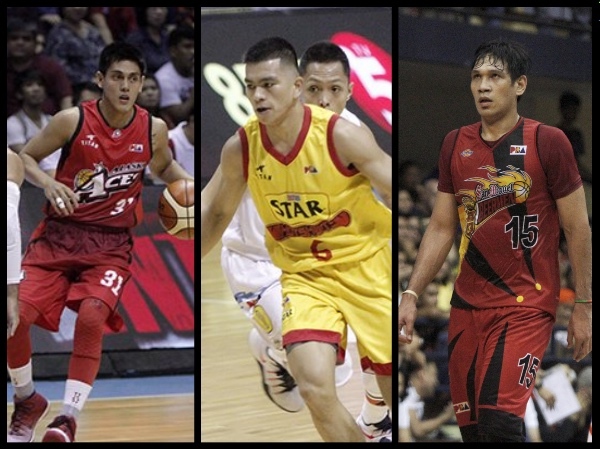 Three more Beermen – Marcio Lassiter, RR Garcia and Ronald Tubid – finished in double-digit scoring as well. It was San Miguel’s third consecutive win as they moved to the top of the standings with a 4-1 record. NLEX, meanwhile, continued its free-fall as they dropped to 1-4 following a fourth straight defeat after winning its season opener. June Mar Fajardo (SMB) - 15pts, 12rebs, 5blks, 1ast. Jonas Villanueva (NLX) - 12pts, 5rebs, 5asts, 1stl, 2 triples. Paul Lee encountered some foul trouble in the game but made his presence felt when it counted as his new Star Hotshots team outdueled his former squad Rain or Shine, 99-91, to extend their winning streak in the Oppo PBA Philippine Cup on Sunday at the SMART-Araneta Coliseum. Peter June Simon led Star with 16 points but the team got huge contributions from all over in this one. Lee tallied 14 points and four assists but came up huge in the clutch as he scored half of his total in the fourth quarter while also making a couple of big assists in the dying minutes. He also had five fouls but was still able to play more than 30 minutes, the second-most on the squad in this one. His backcourt partner, rookie Jio Jalalon, also had a big outing with 14 points, five rebounds and a game-high six assists while Aldrech Ramos, another new acquisition for Star, knocked down two big three-pointers in the last two minutes en route to 12 points. Marc Pingris added 11 points, eight rebounds and three steals while also making a crucial defensive play late in the game. Jio Jalalon (STA) - 14pts, 5rebs, 6asts, 1stl, 2 triples. Raymon Almazan (ROS) - 19pts, 13rebs, 1stl, 1 triple. The streaking Alaska Aces picked up a third straight victory as they cruised to a 101-86 rout of Barangay Ginebra in the Oppo PBA Philippine Cup on Sunday at the SMART-Araneta Coliseum. Alaska, which improved to 3-2 in the standings, led by as many as 30 points in the fourth quarter in the lopsided contest. RJ Jazul paced Alaska with 16 points, going 5-for-8 from beyond the arc. He hit three of those triples in the fourth quarter to help hold off the late Ginera charge. Calvin Abueva added 12 points and five rebounds in under 18 minutes of play while Vic Manuel and Chris Banchero chipped in with 10 points apiece. Seven other Aces scored six or more points in a balanced scoring effort. Rookie Kevin Ferrer hit five three-pointers en route to a game-high 19 points to lead Ginebra, which dropped down to 2-3.
RJ Jazul (ALA) - 16pts, 2rebs, 3asts, 1stl, 5 triples. Kevin Ferrer (GIN) - 19pts, 4rebs, 1ast, 5 triples.